With Javier Mascherano still sulking until he gets his move to Barcelona, it now looks like Liverpool have a fight on their hands to keep hold of forward Dirk Kuyt, with the Dutch international reportedly pleading with the club to let him join his former coach Rafa Benitez at Inter Milan in a deal said to be worth upwards of £13 million. “The clubs continue to talk, but Dirk has told Liverpool he no longer wants to be involved as this is something that regards his career and life. “When Benitez left the club he signed an agreement that he would not poach players from Liverpool and I think that still applies. As far as I’m concerned, the agreement with Inter president Massimo Moratti still stands. 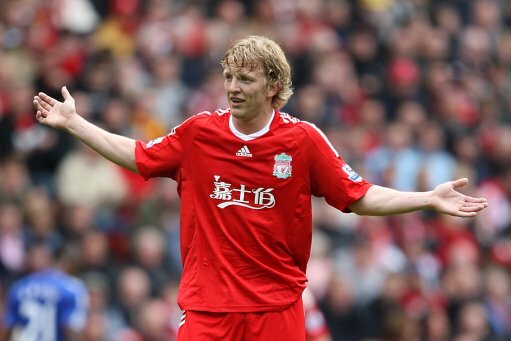 We have not received an offer from any club for Dirk Kuyt, this is obviously something going on behind the scenes with the agent talking to possibly the manager of Inter. Two things. One, we don’t welcome an offer and two, we haven’t received an offer. At this late stage in the transfer window it would be remarkably unusual for us to accept an offer for a player we don’t want to leave for money we don’t need. Could this be Ryan Babel‘s time to shine? No, probably not. Everyone into the lifeboats, this ship is sinking fast! Purslow can’t expect Rafa to honour his ‘agreement’, given the lying Purslow’s disgusting conduct when sacking Rafa. What value had the contract Rafa signed last year? None. Rafa can try to sign who he wants, Purslow has lost all respect and credibility. As for Roy, watch your back, further embarrassments like City, and you’ll be receiving a stab in the back too. 13 mil for kuyt? i’d take it. then sell mascherano and use the money to get two genuinely good centre mids. @ spectator – I’d rather we got two genuinely good strikers/wingers. I agree Phil. The two hard working winger with no creativity system we had against Man City was a poor choice, and I think Jova has a higher ceiling and has been playing better in recent games. I’d assume that may have something to do with Kuyt’s heart being with Liverpool anymore, but ultimately, 13 million for a pretty average winger (his work ethic excluded) who cannot cross well and has had his pace diminishing each passing season would be a good idea. Get another Maxi-esque Winger to pair with Jova instead. Arda Turan would obviously be a brilliant fit although I’ve given up on Roy signing him anytime soon. The one huge problem is whether or not we have time to reinvest that money into another player. I’ll assume that Roy has a few prospects lined up, but less than a week to agree to terms and complete the signing is a very tight time frame.